I haven’t used either devices very long. I picked up the Nook Tablet on Tuesday and the Kindle Fire on Wednesday. After using both for this short time, I long for a 7″ iPad but the iPads are twice as expensive as the Nook Tablet and Kindle Fire and to compare the 7″ models to the 10″ iPads is comparing apples to oranges. They are simply not the same thing. The Nook Tablet and Kindle Fire are essentially media consumption devices. This means that creating documents or writing long emails is not advisable. Neither allow for pairing of a keyboard with the devices thus in order to interact you must use the on screen keyboard. So yeah, I won’t be sending out any emails of importance from either tablet device. Kindle has only one button and that is the power button. The Nook Tablet has a power button, a home button, and volume up/down buttons. I think that this is a preference thing. I would have liked a home button on the Kindle but I think that is because I am used to the home button on my iPhone. Once you get the hang of tapping the screen, however, it becomes natural. The important settings are easily available on both devices such as wifi access, brightness, volume, and screen lock with an easy tap on the menu bar of the Nook Tablet on the bottom and the settings icon on the top menu bar of the Kindle. To maneuver through the content both devices have provided carousels. The Kindle carousel is on top. The Kindle has a seemingly endless number of shelves that allows you to store favorites: apps, books, magazines, or video regardless of whether the content is sideloaded or purchased directly from Amazon. The Nook carousel is smaller and on the bottom. The Nook has three home pages and you can drag books and magazines you have purchased onto the home pages. Apps, however, stay in the carousel or are accessed through the App tab. The Kindle Fire takes advantage of the screen rotation and it looks just as nice in landscape as it does in portrait. The Nook Tablet can only be viewed in portrait. This is a problem throughout the Nook Tablet. Not all apps use the landscape capabilities of the device. For instance, the music app only displays controls in portrait. The built in music app is very simplistic and doesn’t allow for creating playlists on the fly unlike the Kindle Fire which has a more robust music app built in. Both devices have a problem with upside down portrait and upside down landscape when watching video. They only allow one portrait view and one landscape view as opposed to the iOS which allows you to view video in all four views. The default reading apps for both devices provide the same standard tap zones: right to go forward and left to go backward. You can also swipe right and swipe left anywhere for next/back. Press and hold a word or press and drag to highlight a section. You are given a note/highlight/search option. With the NookTablet, you are given a “share” option. On the Kindle Fire you can change the font style, typeface, 8 different font sizes, 3 margin styles and three color modes (white on black, black on white and black on sepia). The Nook Tablet allows you to select from 6 fonts, 6 background/font themes, 3 line spacing choices, 3 margin styles, and several font sizes. A tap in the upper right corner leaves a bookmark. Tap again to remove the bookmark. The Nook Tablet boasts 16GB of memory which is twice as much as the Kindle Fire. Only 1 GB of the Nook Tablet is available for non Nook purchased content. Given that Barnes and Noble does not sell audio or video content, only 1 GB is available for the non book, non magazine content and 12 GB for BN purchased content. 3 GB is for system. Thus that 16 GB of memory space is very misleading. The big benefit is that the Nook Tablet has an external micro SD slot which will read cards up to 32 GB in memory. One micro SD card will hold about 15 movies. The micro SD cards range in price between $12 to $40. (It’s a good item to pick up during Black Friday and Christmas sales). The Kindle Fire has only 8 GB of memory space, 2.5 which appears to be for system and 5.5 for personal content. It has no external memory slot. Instead, Amazon expects you to make use of the cloud. It stores movies and videos that you purchased at Amazon but it also allows you up to 5GB of space for personal content. You can purchase additional space such as 20 GB for $20 per year and this also gives you unlimited space for music. Unfortunately, you can’t easily sync your Kindle Fire with the Cloud drive (except for music). If I upload a document to Cloud, I can access it via the Kindle Fire web browser and it is saved in the “Docs” tab. That said, I can’t stream any personal video. Even though Nook Tablet internal memory has only 1GB, the external memory slot is meaningful if you want to add your own content. I did not run any specific tests, but the Nook Tablet definitely had more battery power. Both devices come with chargers although the Kindle Fire does not come a USB cord. If you want to get something on your Kindle Fire, you can use any standard micro USB cord for transfer. Both the Nook Tablet and the Kindle Fire can only be charged with the included adapters. The charger with the Fire is 1.8 amps and most USB ports are rated at .5 Amps. The iPad, for example, won’t charge off many PC USB ports because it needs a 1 Amp charge. The Kindle Fire could charge off a regular micro USB if the amperage supplied by the adapter is nearly two. The wall charger included with the iPad, for example, is rated 2 Amps. You can find 2 amp USB chargers at many electronics stores. The Nook Tablet, however, needs to be charged with its special elongated micro USB port. The design of the Kindle Tablet is like one big slab. Ned said it was a very masculine design. It’s heavy with a rubber back and very slightly rounded edges. The front is all glass. The Nook Tablet looks exactly like the Nook Color down to the silly loop. The one change is that the front trim piece is slightly rubberized like the back and the edges are all rounded. The Nook Tablet is much more comfortable to hold than the Kindle Tablet. That said, I have to take the Nook Tablet back because the upper rubber frame is not fully soldered onto the rest of the device because when I press down, it makes a clicking sound and you can see that the frame is slightly separated from the base. Maybe that’s a feature? 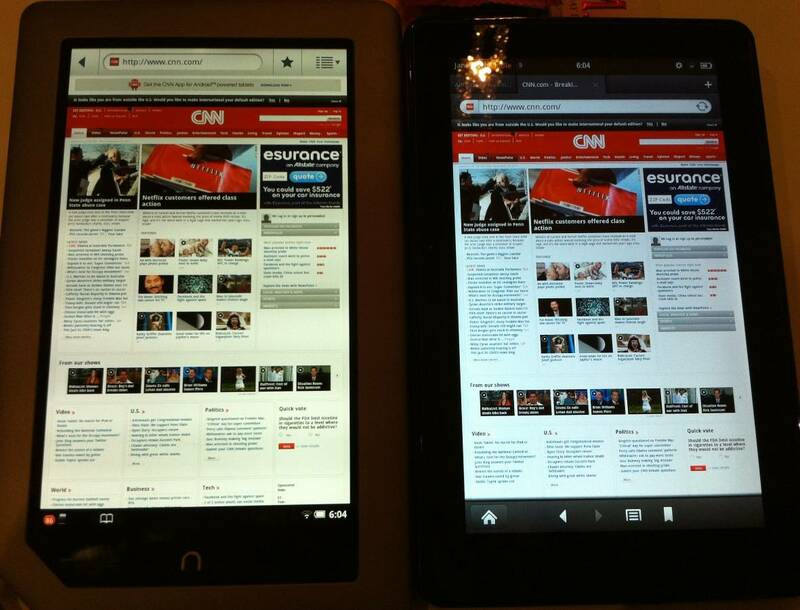 I thought the screen on the Kindle Fire was slightly clearer than that of the Nook Tablet. (Click for larger image). The Nook Tablet is less reflective which made reading outside much easier (although not as good as an eink or the iPhone). The Kindle Fire’s screen is reflective enough to serve as a mirror in a pinch. The Nook Tablet has more processing power and more RAM and one area in which this should show up would be in the web browsing but Amazon’s SILK processor does its job here. When you visit websites on the Nook, from time to time you will get the mobile version. On the Fire, it is the full fledged web page. The sites load slightly slower on the Fire the first time but the second time you visit the same site, it is very zippy. Navigating on the web, however, isn’t as smooth as from a laptop or an iOS device. On the Nook Tablet, for example, on the google search page, when you tap it you can’t tell if you’ve tapped on the link and it can be frustrating. This isn’t true for all pages. On the Fire, when you double tapped to increase the text, it was like an animated increase instead of an immediate one. The App Store exemplifies the differences in philosophy between the Kindle and the Nook. Nearly all of the apps in the Nook App store cost money and generally the prices are around $2.99. There are hundreds of free apps in the Kindle App store and most apps are around $.99. For example, the Amazon App Store has Angry Birds with ads for free and Angry Birds ad free for $.99. The Nook App Store has Angry Birds for $2.99. I could not tell a difference between the two paid for games. The Amazon App Store is less expensive and has so many more apps. Amazon is the clear winner in this category. Amazon sells music, videos, has a more robust app catalog and better prices all around. The only way to get video on the Nook Tablet is either subscribe to HuluPlus or Netflix or create your own digital files from physical media. Amazon offers free thousands of free movies and television shows to its Prime membership in addition to video purchases and rentals plus the ability to use HuluPlus or Netflix. Barnes & Noble sells no video nor music. Amazon has been consistently undercutting prices at Apple by selling songs for $.69 and many albums for under $10 and many of the most popular albums for $5. B&N offers Pandora for audio streaming. It was actually this lack of content access that made the Nook Tablet feel more like a fancy and robust color reader and the Amazon Fire more like a mini tablet. Sideloading refers to adding content not purchased through the device itself. It is far easier to sideload with the Fire. The Fire’s email app allows you to send and receive attachments including video, apk files, books, etc. The nook tablet does not. I was able to easily open PDFs I found on the internet with the Kindle Fire. I had problems with the Nook Tablet. The Kindle Fire and Nook Tablet are actually as open as the Kobo Vox purportedly is. You can sideload almost any Android app that you can find an “APK” for. Brian wrote some great instructions up. The Kindle Fire is the easiest to add additional Android apps. You download a file explorer like ES Explorer (free) from the Amazon App Store and then google for your .apk files or email them to yourself or create a folder in Dropbox where you will store the apps. The sideloaded apps act just like the ones that are purchased from Amazon App Store and they show up in the App folder and appear in the main carousel and can be favorited. Sideloaded content is treated nearly the same as official content. I found, however, I could not mail myself a mobi file or download one from the internet and open it in books. Apparently the Kindle Fire does not use the Personal Document service that Amazon has created for Kindles. The Kindle Fire also does not support collections at this point. Through some research, the folks over at mobileread solved the problem. You need to download File Expert from the App store, choose the book you have downloaded, and under Choose Applications, select Amazon Kindle. The book will not open. Instead, tap Home and Books. Your mobi book will have magically appeared. The Nook Color is a little more difficult. It required a special link created by an XDA Developer forum user. Additionally, some of the apks that worked fine on the Kindle Fire did not work on the nook. The XDA Developer forum had links to apps that worked. Once the apps are on the device, however, they don’t show up in the app folder. Instead, you need to install a launching program like “go launcher” and then when you want to access those sideloaded apps, you have to use the search feature to find open Go Launcher. This is a hassle. Sideloading is much easier with the Kindle Fire. If you are going to make your own videos and you really want that extra memory slot, go for the Nook Tablet but there is just more and cheaper content to use on the Amazon Fire and I do think it is a bit easier to navigate (although not by much). I love the 7″ size. It is perfect for nighttime reading and watching video. So perfect, in fact, that I have been watching far too much video and reading far too few books (only one since Tuesday and that was Joanna Chambers’ A Lady’s Secret which I enjoyed quite a bi). The operating system isn’t as refined as that of the iOS but the screen size makes it a better deal. I’ve been thinking about getting a Kindle Fire for my nieces – they loved watching movies on my iPad2 but unfortunately for them, their aunt is not a millionaire. Did you happen to get a protector/cover with the Fire? I’m just curious what types of “drop-proof” protectors/covers are available. I like the idea of the Amazon Online Video access, because it seems to have a comparable selection to the iPad/iTunes. Thanks for this. Hemming and hawing over whether to get my son the Kindle Fire or the ipad2. Still undecided but this info on the Fire helps a lot…and being that it’s a lot cheaper, I’m leaning its way. Think the ipad would impress him more ’cause kids these days love that little apple on all their “toys,” but saving a couple hundred bucks sounds nice. Great write up. I received my Fire on Tuesday, and while I have a few minor quibbles, I am very happy with the purchase. I love the size and the clearness of the screen, though the battery life could use improvement. Ease of use is a huge bonus with this device. I would recommend one to my non-techie mom and not have to worry about her having trouble getting it running. Thanks for the comparison, Jane, I’ve just started looking at the Fire for the kids and have one more question: Does the Fire have free 3G like the kindle or do you require a monthly subscription for when wifi access isn’t available? The Fire’s wi-fi only, sadly. My mom doesn’t own a computer, so I’ve bought her a Kindle 3G Touch, but if the Fire had a 3G plan available I would have bought her that. Reading AND the ability to have email (and maybe Facebook, but not likely). It’s the SD card slot that is the winner for me. I have a Nook Color (first gen) that I’ve rooted through the SD card to make it a fully functional Android tablet running CM7 (Gingerbread, or Android 2.3). The system is as solid as a rock, whereas I found that messing with the internal firmware made it a tad flaky. Moreover, if I take out the SD card, I get the original Nook firmware back. But I haven’t got my hands on a Fire yet, and I won’t, until I visit the US next year, so you never know. At least by then the Android community will have got with the program and probably rooted both devices. The answer to “why would you?” in my case is because I get a fully functional tablet with a great screen for half the price of the equivalent. Wonder if Amazon plans to roll out the Touch and the Fire to the UK before Christmas? I doubt it, but they’re missing a trick, because people over here are gagging for them. Now, with B and N’s announcement that they are planning to roll out their tablets and the store, it’s heating up good and proper. In Europe, the Kindle and the new Kindle are against the Kobo and the Sony reader, but the market is underdeveloped, although it’s catching up like lightning. Someone on Twitter suggested I post a few of my impressions of the Kindle Fire as an FYI for folks who are reading the thread. I’m returning my Fire on Monday, as it turns out not to be the device for me, and I’m actually taking a step “up” in functionality to a 10″ tablet. I can see how many people would be happy with their Fire experience. It is an excellent portable device with so much to enjoy–a great vehicle for using Amazon services. And the screen is pretty. I think it’s an excellent quality for the size. I found the preloaded apps annoying. Without the capability of creating folders for content, I felt like it make the Fire seem a little junky. I also didn’t like the lack of folders/organizing capabilities for books, and it probably was the same for movies, although I didn’t get that far. I also couldn’t figure out how to remove things from the carousel once I looked at them. There might be a way; I just couldn’t figure it out in the time I’ve played with the Fire. If there isn’t, and those items remain on the carousel until they fade into the background eventually with other use, people with children will want to be careful of the content they view. But I no longer have a small child at home and Amazon might add greater functionality in the future, and I could have gotten used to the current limitations and annoyances. In fact I was fully prepared to. Then I tried to watch a streaming movie. In fact I tried three different movies. Much to my surprise and dismay, I could not get comfortable with the screen at all. Others will probably not have that problem. Jane, from your post, it sounds like you enjoy the screen just fine. Like a lot of people over forty, I wear bifocals. I tried watching the screen without wearing my glasses. I tried bringing it close and setting it at different angles. Then it was too close and gave me a headache. I tried moving the screen back but when I got it to a comfortable distance, the images were much too small to enjoy. I couldn’t make out actors’ facial expressions, or read signposts or messages within the movie itself. In my imagination, the 7″ size was cozy, and it would fit into my purse (or carry on) much more easily than a larger tablet. The reality of it turned out to be much different. Yes, there’s the portability, but since one of the main reasons I wanted a Fire was to make use of streaming videos and movies from Amazon, the problems I had with the screen were a deal breaker. But I really, REALLY wanted a tablet now. I started reading details about iPads. Then I played with one of my roommate’s Xoom and had quite a talk with them about that particular product. I think the Xoom is physically clunkier than the iPad2, but there were so many other positives to the device–including how I found a Xoom for $100 cheaper than the cheapest iPad. There are a lot of technical and other reasons why I chose Xoom, but that issue seems suited to another comment thread. The main point was, versus the Fire 7″ screen, the 10″ screen was much more comfortable for me. I could instantly find the right distance and position for viewing, and the picture was large enough to get the detail that frustrated me about the Fire. I love the new word “vomparable!” Let me use it in a sentence. @Lynne Connolly: FYI, the Fire can be rooted already however rooting breaks video streaming at this point. At this point it looks like the Nook Tab will not be as easy to root as the Color is and there is some word that the alternate OS on an SD card will not work. Must have been an easy root! I don’t think I’d go for a reader that can’t be rooted, because the price of tablets is coming down nicely. Might as well go for one of those, as long as it plays nice and the screen is a good one. BTW, you can charge the Nook Color up with an ordinary micro USB cord. You have to put it in the charger, not the computer, turn the NC off and wait – and wait. But if you’re away from home and stuck, it can be done. I usually hook my NC up to the computer with an ordinary USB micro cord, that seems to work okay if you want to sync stuff with Calibre and suchlike. BTW, does anyone know if you can reduce the margins on the Nook for Android app? I downloaded the latest version (3) yesterday, and the margins are humungous, even on the lowest setting. I’ve been playing around with the Fire most of the morning. At first I loved it so much I was willing to invite it to be my secret lover. Then I ran into the limitations of the 8GB storage and the difficulty of putting my own video media in the Amazon cloud and getting it to play on the device. It was a little like discovering what you thought was the perfect man is unemployed and unmotivated with no plans to ever move from his Mom’s basement. @Thea Harrison: I understand your disappointment with the Fire if what you really wanted was tablet. I have a Fire and an iPad, and I love them both, but they both do different things. I think a lot of people are buying the Fire thinking they are getting a fully functional tablet – I think they are getting a high end ereader with some tablet functionality tacked on. One of things that I love about the Fire is that I can change font style and font size, because my peepers aren’t what they used to be, either. Physical books with a smaller type face are difficult for me to read now (and yes, I do need to get my vision checked! I need new glasses), but the ability to increase the text size on the Fire is one of my favorite features. The back-lighting is what sealed the deal for me. I need a bright page(screen) to see well, and the backlight is something I need. I was still hemming and hawing over transiting to ebooks, but after getting the Fire, I am not so reluctant to let go of all of those space eating paperbacks/hardcovers. Although I did want a regular tablet some day, I actually would have been fine with less functionality, since I was buying the Fire to use as a toy. The deal breaker really was that I couldn’t adjust to the screen size. I figured if the Fire didn’t work for me I might as well step up to the next level. It is certainly wonderful to use ebook readers to save space, isn’t it? I love my other (regular) Kindle, and especially adore being able to change the font size. @Lynne Connolly: Under all settings you can set margins to small, medium, large and x-large, but often even the small setting (even with pub defaults turned off) often gives kinda large margins IMO. I’ve had better luck getting smaller margins with B&N books than with sideloaded ePub content. @Manga Maniac: Considering your name, I’m wondering: Have you tried manga on the Kindle Fire? If so, how did you like it? @LG: I have only had time to try reading manga from emanga.com. The experience was a bit frustrating – while I liked the crisp look of the pages, moving from one page to the next was not smooth and it left me irritated. I have to play with it some more, though, both at emanga and using some of the comic apps. Thank you so much for this side by side comparison. I want to get one or the other for my daughter for Christmas, and I’m really torn. I have an Amazon Prime membership so the Fire seems the way to go in that she’s about reading and watching movies, so content is key. However, the limit in memory and the lack of an SD slot really bother me and make me think maybe the Nook is the way to go. We also have a Netflix subscription so she could watch video that way. However, one thing I don’t like re: the Nook is that so much of its internal memory has to be used for B&N purchased content. Really, in the end, I think the cheaper price on the Kindle might be the tie breaker since she’s going to want to move up to a tablet in a couple of years anyway. Thanks for the comparison, Jane. I’ve been torn between which one I’m going to get my mom for Christmas. I’m going with the Fire because she is going to mainly use it for reading and playing games. Since the Fire has more and cheaper apps, I think that’s going to be the best bet for her. I don’t see her side loading a lot of content or streaming a ton of movies, so I don’t think the limited space will be an issue. Jane, if there was a 7″ iPad, I too would buy it in a nano second. Lets start a petition! Seeing as there isn’t a mini ipad, I went from Nook Color to a Galaxy tab. Mostly for the 3G, but also for the bluetooth for a keyboard. I have Netflix but not Hulu. Cost less than either Fire or Nook. And it fits in my purse and in my hand better. Plus it has swype for auto correction. I don’t know why the Galaxy tab is never mentioned and compared to these devices. Probably because it’s an older device, both in terms of how long it’s been out and the hardware specs so it gets forgotten (it was mentioned a lot back when the Nook Color came out). With the newer Galaxy Tab 7 Plus (better specs, Honeycomb, but $$$$) out now (and the 7.7″ coming in non-US markets) I don’t know if Samsung will even continue to offer the original 7″er or not once they sell through the already manufactured hardware. You’re right that it’s a pretty nice device though, although I’ve never seen it cheaper than the Nook or Fire unless it’s with a $$$ data contract.